Good Sunday, Friends! 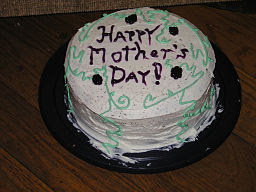 And Happy Mothers' Day to all who are celebrating today one way or another. Celebrating your own mother or grandmother or favorite aunt or perhaps a woman who has been a mentor to you at one time or another. Or perhaps you are celebrating your own 'motherhood' of children or even (ha) of a beloved and loyal cat or dog in your life. Smiles. This has been another busy week at Poets United. Thanks to Susan for her interesting Midweek Motif topic - Secrecy! I regret that I didn't take part, as life got in the way; but I am heartened by the fact that SO many people did! I hope you all have read Rosemary's The Living Dead this week. She features the poet Dorothy Porter's poem "Gorgeous Breasts." That title certainly got MY attention. I hope it also gets yours. Take a look, if you haven't already. Monday Sherry has a fascinating interview for us. She has talked to Therisa, a fellow Canadian, and I know you will enjoy this article that will go live tomorrow right after the Poetry Pantry link expires. Stay tuned! Wednesday Sumana is in charge of Midweek Motif. Her prompt is BIRDS! I look forward to seeing what everyone comes up with for this timely prompt. At least here, now that it is spring birds have been particularly active! Next week here in the Pantry we will see photos of a country that has never been featured here before. I think you will enjoy! With no further delay, let's share poetry! Link your one poem below. Stop in to the comments and say hello. Then make the rounds of the poems written by others! I will see you on the trail as the day goes on! Wonderful and a good morning to all. In our part of the world it's not the Mother's Day .. But of course she is very much in my thought. A day to celebrate indeed, Sumana! Happy Mother's Day to those who celebrate not only mothers and children, but also the peace making and restorative justice which create safe environments for children and other living things. I shared a poem about mystics, but now have another poem in mind. Gee. I'll be around again and again as way opens. Again, hello fellow poets! What a beautiful spring day....a wonderful day for reading poetry as well! Looking forward to reading YOUR words. Hope everyone is enjoying the day! Happy Mother's Day and Happy Sunday! Wishing all a wonderful day full of poetry and fun. To the mothers I wish you a Happy Day to the grandmothers I say "thank you!" will be back to read later. Happy Mothers Day to you Mary and to all who give in a mothering way at PU. Wow, a stocked Pantry this morning. Thank you, Mary. I have been busy feeding horses, dogs and kids, so am late getting started. It is a gorgeous summer day here..........hope you all have a lovely Sunday. Happy Mother's Day to all of our mothers! I am not a mother but happy to celebrate a wonderful Sunday with everyone! My bicycle rides always make me happy and I had a good one today. I fed the pigeons my crusts of bread and one sat on my finger and ate from my hand. I got home just in time to share a poem! I share a poem from the past today called Exposed. I hope you like it and I'll be around to read this week!